We’ve won a prize! The Royal Astronomical Society has given the Galaxy Zoo team – including the volunteers who have made the project the success it is – their Group Achievement Award for 2019. I will post the citation below, but mostly I’m delighted that this award recognises all those who have worked to make Galaxy Zoo a success. Looking at the list of previous winners – the last two are the team behind ESA’s Planck satellite and the team who made the Nobel winning discovery of gravitational waves – is humbling, so this is really something to be proud of. We’ll make plans to make sure everyone can celebrate the award when it’s presented at the National Astronomy Meeting later in the year. The 2019 Group Achievement Award is awarded to the Galaxy Zoo team. With over ten years of engagement under their belt, the Galaxy Zoo team have contributed significantly to our knowledge of the formation and evolution of galaxies, through strong commitment to collaboration with members of the public. They have established citizen science as a standard mode of data analysis across astrophysics, and initiated new areas of research sparked by Galaxy Zoo discoveries. Their roughly 55 papers, ranging from studies disentangling morphology, environment and colour, through to studies of individual morphological characteristics, have been enabled by the team’s careful work to create catalogues and measure systematic effects inherent in the classification, before releasing the data to the community. 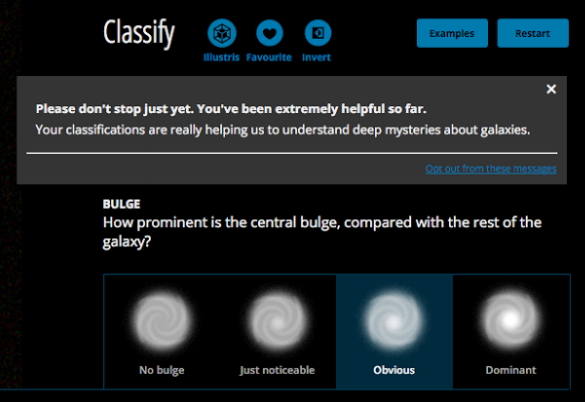 The Galaxy Zoo project has also inspired many similar projects across astrophysics and beyond, through the Zooniverse platform. Perhaps Galaxy Zoo’s most notable achievement is immensely effective outreach: the more than 500,000 people who have contributed to date come from a wide range of backgrounds, making participation in scientific research possible for all. Galaxy Zoo inspires and informs, and does so on an unprecedented scale. For these reasons, the Galaxy Zoo team is awarded the Group Achievement Award. Some of you may remember a while back we posted a blog announcing that we would be testing a new messaging system on Galaxy Zoo. Some of you may even have seen these messages while classifying on the site! This test was also part of a study of how we could use messaging to increase engagement on the project. Working with researchers from Ben Gurion University and Microsoft Research we delivered messages to volunteers at key times during their participation on Galaxy Zoo and observed how these messages affected their engagement. This research was based on previous work we had done that demonstrated that sending similar messages in emails could increase the likelihood of volunteers returning and engaging more with the project. This screenshot shows an example of how the messages were shown in the Galaxy Zoo classification interface. The volunteers were split into three main cohorts; One group who were delivered the messages at random intervals, one group who were delivered the messages at what were predicted to be optimal times, and a final control group who received no messages. 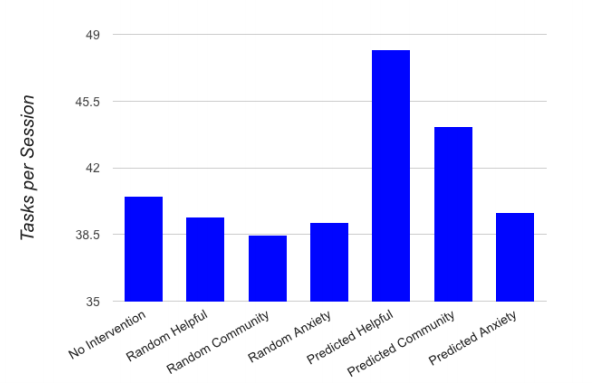 This study has led to two peer-reviewed publications and the results show that optimal timing of an intervention message can significantly increase the engagement of volunteers on Galaxy Zoo. This plot shows how the messages sent at the predicted optimal times were significantly more effective at increasing engagement than those sent at random. These early results are intriguing, and we’d like to do more tests to see if it’s something we can use more broadly across Zooniverse projects. The same machinery might also be used by Zooniverse teams to send messages to volunteers – either in a group or individually – as they participate in their projects. We’ll keep you informed on the blog. For a discussion regarding the ethics of this study, please read this Zooniverse Talk thread https://www.zooniverse.org/talk/14/675633.